This is the cry of my heart as I leave for Costa Rica. “We wanna burn with passion like never before, so start a fire Lord.” Expecting great things from our Father. Prayers appreciated. Right in front of my face, with only five verses of Scripture, a simple and straightforward message presented itself plainly – without having to try to create one out of it. 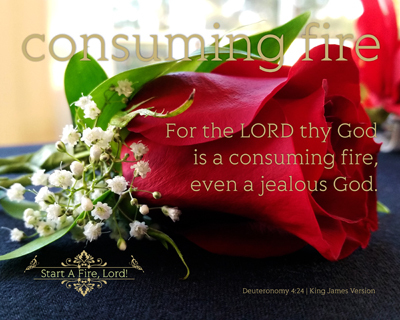 The first verse utilized tell us “Who” God is by way of something we can understand “is a consuming fire” Deuteronomy 4:24. The second verse tells us “about” Him in simple words “is good” and “his mercy” in II Chronicles 7:3. The third verse indicates His “power” by means of tools that we can identify with in “a fire” and “a hammer” used in Jeremiah 23:29. The fourth verse indicates for us a formula for living by “seek”, “live” or “lest he break out fire” in Amos 5:6. Then finally by looking at the refiners process of “fire, refined, tried, call, hear, say, my people, my God” in Zechariah 13:9. The more the Series was worked on, the more powerful the message grew to become – simple, powerful and to the point. God the Father is WHO He says He IS! He also DOES what He says He will do. We as Christians will find over and over again that those things and peoples who promises were made, each of them were fulfilled. The fulfilling for us in this day was paid for in full by Jesus Blood – hence the red roses – the color of blood. The following Title Stream makes up the five (5) prints developed for this Series utilizing a special set of red roses. Interestingly enough, they are comprised of verses of Scripture that all have “fire” and “LORD” in the entirety of their content. Is there a digging spirit about you when it comes to God’s Holy Word? As you take the time, it is assumed that a daily time is taken already to do so, to read God’s Word, is there a desire in you to find out what it means, who it applies to and how what you’ve read makes application to YOU today? I’ve always been told “The shorter, the better” when presenting something to folks that may have little exposure to what is being talked about – “leave the heavy duty stuff to those that talk back…” was a constant reminding phrase for me as a kid. Will we see the small “nuggets” in what we read and make application of in our lives from God’s Word? There are times when the tough stuff is hard to make work, but if your life is like mine – sometimes those little things are more difficult to get placed just right. It is my prayer that this “micro” Series of sorts will help “Start A Fire” in each of us and will Encourage us and other through us to keep ourselves pointed toward the Lord! What is in a word? Or, two in this case. People in general may not see the link between the two of them, but looking at them through the lenses of the Bible, one can see clearly that they both are matched up to each other in a manner of speaking. True wisdom and understanding of things WELL beyond our ability to comprehend as Christians comes from our Heavenly Father, by way of the Holy Spirit. Appropriate integrity will have us doing all that we do as if we are contemplating, doing and completing every task for our Lord and Saviour Himself. Being wise and having wisdom is SO much more than knowledge, but many think they are the pretty close to being the same thing. Wisdom is “The right use or exercise of knowledge”, which we have to receive some training and guidance on the “best means to accomplish…” a task or process / thinking, which requires discernment. By learning to make wise choices with the conviction of the Holy Spirit, our decisions will be shown through and through with integrity. Having integrity is likewise an equally difficult item to maintain and is often misunderstood, if not just plain flat out butchered because circumstances are allowed to change those items that are agreed to and what has been promised to be finished, achieved and completed. The moral standards of times gone by are a rare thing to find in a person given the time and day in which we find ourselves. We as Christians MUST remember that our Heavenly Father has NOT changed, nor has His mandate of keeping our word as He keeps His Word changed. 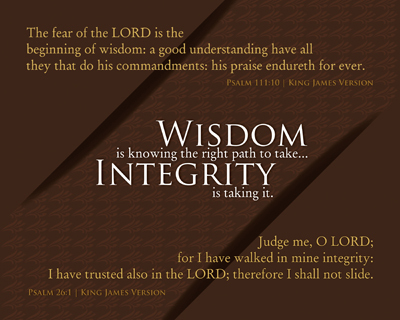 As we seek to be faithful to Him, the tenants of maintaining our integrity should grow and flourish even. We need to keep the line of communication open to the very Throne Room of Heaven, making sure that there is nothing that stands between us. Every facet of our lives should be geared and honed to this process and continual growth of the Believer, such that both Wisdom and Integrity show through, as our relationship with the Lord reaches even further heights. When others see our willingness to do what we say we are going to do as Christians, we are a witness for the Lord and are giving them proof of His Power in our lives to make good and godly decisions that we can then carry out against any opposition. This Series is one of learning to trust and being reminded of Who we are representing in our own lives. Knowledge is one thing, but understanding is an entirely different consideration and application, which for the Christian squarely rests in our Beliefs and Relationship with Jesus Christ. How strongly we rely upon those Beliefs and Relationship will show up in the level of Integrity others see in each one of us. Encouraging others has never been easier! This extension of DeliverTheWord.com focuses on providing Spiritually uplifting ways to let those who you care for know a specific person is praying for them. Biblical grounded encouraging starts here with a vast array of Encouragement options. Copyright © 2003-2014 DeliverTheWord.com. All Rights Reserved.